Sweet, gentle and full of fleece! That is the Alpacas. Alpacas are a beautiful breed with a sweet disposition that are raised and herded for their fiber. "Alpaca" main meaning refers to the hair of the Peruvian Alpacas, and generally speaking it refers to the style of fabric originally made from their hair. Both the camel and the Ilama are related to the Alpaca with all being species of the camelid breed. Vicurias are also a species of the camelid and along with the Alpaca are the most valuable due to being fiber bearing animals. Alpacas and Ilamas can be cross-bred and the result is a beautiful, gentle animal with a unique fleece and sweet disposition call a Huarizo. Huacaya: Soft, gentle and the luxurious feeling of cashmere. That is the Huacaya. The fleece of the Huacaya is used for many fiber processes, namely it is used as a fine suiting cloth. Other uses include, however, felting, knitwear, weaving and blending with other natural fibers. Suri: Elegant, sleek and straight. This is the Suri. While unlike the Huacaya, which has gentle crimped strands of hair the Suri is straight, almost like a silk drape- a beautiful touch. The Suri alpaca is mainly used as cloth for the production of luxurious overcoats. Alpacas Facts: Of the two breeds the most popular is the Huacaya alpaca. Alpacas live in family groups which consists of male, female and their young. The Alpaca's Fiber: Alpaca are herded for their fiber which is a silky, lustrous natural fiber. The Alpaca fiber varies from the sheep's wool as it is hypoallergenic and much warmer and smoother. The finishing process of the hair is much like that used for wool as it is carded, spun, and weaved. Alpaca Prices: Prices for Alpacas in the United States vary greatly and can range between $100 to $500,000. The difference being quality and breed. A deseed male will run the cheapest while world champions will be priced the highest. Alpaca Behavior: Alpacas typically live in family group herds with the male, female and their young- with the male being dominant. The group is fairly protective and when danger is sensed the Alpacas will warn one another by making sharp, noisy inhalations resulting in a high pitch sound. While they do not always attack if the predicator is smaller they may attack with a biting and a kicking. Their disposition is fairly even tempered. They are a sweet and gentle animal and tend to make a humming sound which many refer to as the sounds of peace and contentment, while others say it is to let other Alpacas know they are present. Regardless, they are a peaceful animals. Alpacas are for sale at Animaroo Alpacas. 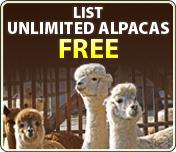 In fact, with nearly a million unique visitors each month we are making a wave in the Alpacas industry by offering top breeders from each of the states in the United States and all the items that you need for your Alpacas. We value our clients and pride ourselves in providing the best service with our Alpacas breeders handy to answer any questions or concerns you may have. Whether in Illinois or Kentucky, California or Washington, you will find Alpacas from top breeders in the state. Take a look around, leave a message if you’d like, we are glad you stopped by!